These dazzling mini petunias are a must for any garden giving a sumptuous display throughout the summer. 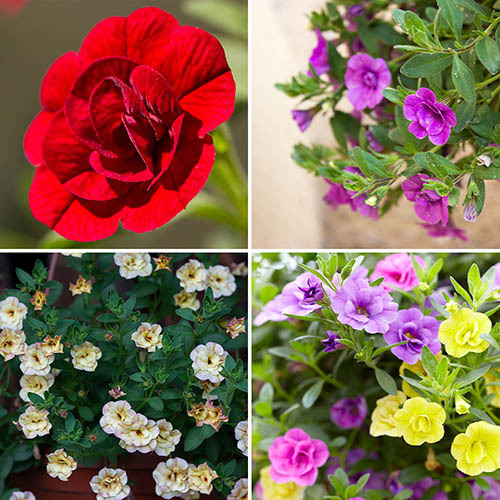 Although smaller than regular double petunias, these neat mini rosebud-like double blooms are produced in far greater numbers meaning your baskets and patio containers will be smothered with colour from late spring to autumn. Known botanically as Calibrachoas, a close relative of Petunias they are vigorous growers and are very easy to care for, they're more resistant to wind and rain than their Petunia cousins so are the perfect plant for UK gardens. Why not enjoy Calitas this year in your garden! Collection contains white, blue, rose and yellow, 3 plants of each. Supplied as 12 Jumbo Plug Plants (2.5-3.5cm Diameter) 3 each of the 4 varieties shown. Flowers from May until first frosts in the autumn. Not frost hardy so keep protected until the last frost. Pot on for 3-4weeks before planting.